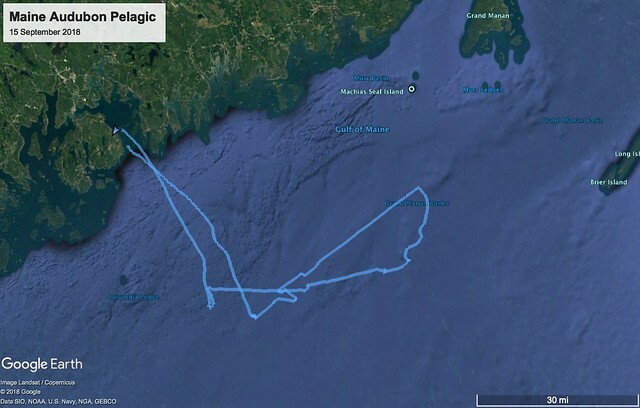 On Saturday, September 15, we ran our annual pelagic trip out of Bar Harbor. The weather and sea conditions in the Gulf of Maine during the fall can always be a challenge, and we were especially cautious this year with Hurricanes Florence and Helene throwing waves our way. Fortunately, Saturday provided one of the perfect windows between any swells and the birds (and mammals) cooperated! There was a bit of fog to contend with first thing in the morning. We knew the waters around Outer Schoodic Ridges would be warmer and fog-free, but we had nearly 50 miles to cover to get out there. The Bar Harbor Whale Watching Company has what I believe is the best pelagic platform in the world with their large jet-powered catamarans — we were on the 130ft AtlantiCat this year — which travel over 30kts with ease and got us out of the fog in no time. We passed small groups of birds en route — Red-necked Phalaropes and small Great Shearwater flocks – but once we could see the horizon the birds were everywhere. What started with constant but mostly individual Pomarine Jaegers turned into dozens once we got some chum in the water. From the back of the boat I had at least 22 Poms in view at one point! Not far from there did we hit the jackpot: First one of the rarest whales in the North Atlantic, a SPERM WHALE was spotted on the horizon thanks to its diagnostic 45º blow. We had a long wait after its terminal dive and just as it resurfaced we encountered our first GREAT SKUA! We call this a “dedicated pelagic birding trip” but the Sperm Whale took priority before our skua chase ensued. Interestingly, review of the fluke pattern on this Sperm Whale seem to match a whale that was seen in this area in both 2014 and 2015. Great Skuas are our primary target for this trip and have been found on five of our six last trips. We had at least four individuals this year, plus two skuas that weren’t seen well enough to be identified (South Polar Skua is the other possibility in the Gulf of Maine). Species counts are raw numbers from the collective eBird lists and may represent double-counted individuals. See the segmented checklists, linked below, for more details on each species. Segmented checklists were kept throughout the trip to put species in representative habitats. You can click the blue “view” links to see each list, or if you were on the trip you can click the red “Add to my eBird” link to automatically add these lists to your eBird account. I have to share a huge thanks to everyone who made this trip possible — from the participants that have faith we will show them birds to our guides who donate their time and efforts to making this enjoyable for everyone on board! I’m very grateful for Doug Gochfeld and Louis Bevier for keeping accurate counts in our eBird lists and Jan Pierson for his expertise on the mic. Zack Klyver, the BHWW naturalist, knows these waters and animals better than most and added so much to this trip. Plus, thanks to the captains and crew of the AtlantiCat for getting us out there, keeping us fed and warm, and getting all of us back in one piece. Thank you everyone!